If you've had enough of removing much of your clothing in front of Homeland Security officers before stepping onto a flight, then the answer could lie in Flyclear. 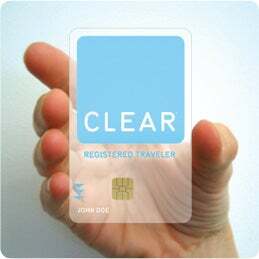 For $99.95 a year (plus a one-off TSA vetting fee of $28), you get a Clear card, a card with a biometric chip that will fast-track you through airport security. For the first step of online registration you will need at least two types of official ID (your Pizza Hut loyalty card won't do) before going to a Clear enrollment center, where they will take your photo and biometric details from you. Although they say that permanent foreign residents can apply, a "US passport is strongly recommended." The company claims that its customer service is "extraordinary" but, from my limited experience, so is that of Homeland Security. Other benefits are fewer missed flights and a "stress-free, predictable airport experience." As yet, the system is up and running in just a few airports, including Orlando, San José and JFK terminal 7, and it is not 24-7, but there are plans to expand this.